My Innova Longarm has arrived! Last week my long awaited longarm finally arrived. After a year of searching and trying out different brands at quilt shows, after months of lurking on such places as the quilt forum, yahoo groups dedicated to the different brands, after calling support phone numbers posing as a customer with a problem to see how I would be treated, I finally decided on an Innova. I also found that there are three other Innovas in my area, so I wouldn’t be alone. Laurie Shook of Kingsbury, TX (commercial longarmer for hire) referred me to the Texas distributor for Innova, Joanne Gemill. I spent a half day with Joanne at Jo’s Quilt Studio in Richmond, Texas, and was convinced my choice was correct. So, I ordered it. to be.) I learned the hard way to disconnect the bands that are attached to the computerized motors so I can freehand. If you don’t disconnect them, you can do fabulous horizontal and vertical lines… But curves… Lets say you would have to be Hercules. Once I disconnected the bands, free motion quilting was a dream. I also learned that they really meant it when they say baste your quilt sandwich. I have to admit, I have done so many smaller art things and its been over a year since I basted anything. I have been saving up my bigger tops until I got the BIG longarm. I put the quilt back on, I laid out and smoothed the batting, I floated the quilt top (small quilt, so didn’t think it needed putting on the roller. ) and I decided to to a digitized pantograph. So it would look nice after binding, I decided to quilt some off the edge. WELL, if you don’t baste… Bad things happen! The all great and powerful Innova Sewing machine head and longarm motors are so strong, that if you are lucky, the only thing that will happen is the machine foot catches the edge of the quilt top and rips your quilt off the leaders. If you are unlucky, and you attached to the leaders in a really strong way, the you rip the quilt top. I was lucky. And I was lucky I decided to use the Red Snappers, for attaching to the leaders. They hold well, but were forgiving enough to let go before my top ripped. Here is a link to the lady who invented the red snappers, Renae Haddadin, showing how they work. 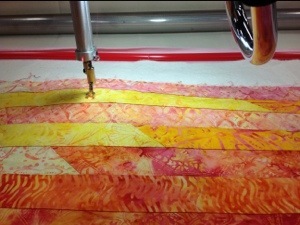 Author FreeFormQuiltsPosted on July 30, 2013 September 5, 2014 Categories TechniquesTags Innova, longarm, quilt backs, QuiltingLeave a comment on My Innova Longarm has arrived!